Leela Cottages, Goa is a luxury boutique resort located on Ashvem beach and only 500 meters from Morjim Beach. This resort tastefully decorated with a traditional Indian design, art and antique furniture offers AC garden and sea view rooms set in a lovely lush garden space and a few minutes’ walk to the sea. The rooms feature a refrigerator, TV with cable channels, writing desk, fan private bathroom, shower and included are free toiletries. Wi Fi is available throughout the resort. The resort has a restaurant, spa, wellness centre and a massage parlour. Other services available include a tour desk, luggage storage and dry cleaning. Car rental and currency exchange can also be arranged. Opening Dates - Open all year. 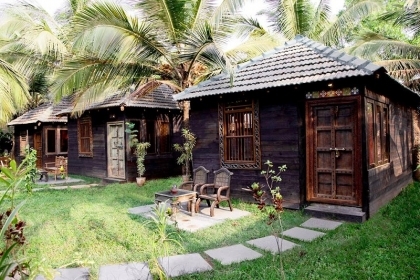 Leela Cottages, Goa is located directly on Ashvem beach, Morjim beach is only a 10 min walk away. Thivim Train Station – 20 km. Dabolim International Airport, Goa – 55 km. Within a 15 km radius of Ashvem Beach is Morjim beach, Mandrem beach, Arambol beach Anjuna beach, and Vagator beach. Nearby Attractions: Anjuna Market - 16 km, Arpora Saturday Night Market - 15 km, Old Goa - 33 km and Panjim - 30 km. The Leela restaurant offers multi cuisine options served by the helpful and friendly staff. Room service is also available.